Algol. It’s a word that’s meaningless to most people, but to Phantasy Star fans, it’s the source of countless cherished memories. It’s where an evil entity was defeated by a band of heroic friends, where an entire planet was cruelly destroyed, and where the fate of humanity was ultimately decided. The name Algol is forever etched in the minds of Sega fans as the setting for the publisher’s most famous RPG franchise, and its name sparks conversation and nostalgia to this day. The world also has historical meaning. Phantasy Star was Sega’s big gun for the Master System, designed to give the console a much-needed AAA title in the push against Nintendo’s Famicom. Its creation would see a union of some of Sega’s most talented developers, names that would be renowned by gamers the world over and for decades to come. Rieko Kodama, Yuji Naka, Tokohiku “Bo” Uwabo – these were the people who would lift Sega to incredible console heights with their designs, programming, and musical talents. Along with several other gifted individuals, they brought us a legendary franchise whose fanbase endures to this day. What would become one of the most famous RPG series of all time started with an 8-bit masterpiece that pushed RPG design into new territory and shattered several genre conventions and a glass ceiling. Foremost among its accomplishments, Phantasy Star made Sega history as the company’s first RPG to feature a female protagonist. In her quest to avenge her brother Nero’s death at the hands of the evil King Lassic, Alis actively assumes the leadership role of her party, taking up arms and seeking out and recruiting other party members. Each has a personal reason for wanting to end Lassic’s reign, but the group would not have likely come together to do so without Alis’s initiative. Young, fiery, and full of resolve, Alis was unyielding in her quest to bring justice and order to the Algol Star System and avenge Nero. Strong female characters were not a widely-accepted concept in video games in 1987. 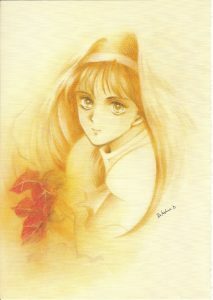 There had been a few, such as Toby Masuyo in Namco’s 1985 arcade game Baraduke, which many consider to be the first game with a human female protagonist. Other would name Nintendo’s Metroid (1987) as the first. Both answers would be wrong, and Sega actually beat them to the punch in arcades and on consoles. In arcades, Ninja Princess (known as Sega Ninja in the West) appeared almost half a year before Baraduke, and Yuji Naka’s SG-1000 debut, Girl’s Garden, was released in 1984. It’s not entirely clear if that game was the first overall, but it definitely preceded Nintendo’s efforts. That such forward thinking against gender stereotypes would happen at Sega should not be all that surprising. The publisher had a pretty open policy regarding women in video games for both characters and developers. At the time, there weren’t many women working in the industry overall, but Sega was smart enough to hire one who would help craft some of its most enduring franchises. She was also quite interested in using female protagonists in her designs. Rieko Kodama would not only go on to become known as the “first lady of RPGs” but would also earn a distinction as one of the earliest advocates of female video game leads. Kodama was given a pretty wide berth when it came to design. According to her, Sega judged its employees on individual ability and not gender, which made it easier for her to advance and implement her ideas. Her interest in strong females didn’t actually begin with Phantasy Star. Kodama had studied graphic design in college, and she knew she wanted to create her own characters and worlds instead of simply realizing the visions of others. She was hired at Sega in 1984, and after her debut title, 1984’s Championship Boxing, she worked on Ninja Princess. It was here that she first implemented her concept of a female lead, a regal, diplomatic princess who turns into a ninja heroine with a puff of smoke. Throwing stars in hand, she sets off to save her province from a traitorous tyrant. Ninja Princess paved the way for Kodama to pursue further design opportunities, and the experience also gave her valuable training in creating sprite graphics. She had the opportunity to work with Yoshiki Kawasaki, who had done sprite work for Sega games like Spatter and Flicky. Soon, she made the transition from arcade games to the Master System, sharpening her designs skills on Alex Kidd in Miracle World, Quartet, and Fantasy Zone before landing her biggest title to date. By 1987 Kodama found herself as part of the team tasked with creating an RPG for Sega’s Master System. Sega was looking for a title that would help move the console in North America and Japan. Ideas were solicited from internal staff, and a designer named Chieko Aoki submitted a treatment she had been working on for some time. It involved a mixture of fantasy and sci-fi elements, with multiple worlds to explore and scores of monsters to kill. When Sega asked for submissions, Aoki’s draft was already far along, to the point that almost all the dialogue was already written. Once it was approved, a team was assembled that included Aoki, Kodama, Kotaro Hayashida on design, and Uwabo on sound and music. They all worked out of the same room, and Aoki became the go-to person for questions about the game. She answered so many of them that she earned the nickname “Otegami Chie” (Letter Chie). Aoki’s story was heavily inspired by Star Wars, mixing several elements of the classic sci-fi franchise with her own original designs. As a contrast, she worked to incorporate elements of fantasy into her narrative, and having a woman as the star distinguished it further. Sure, Princess Leia was already a strong and universally recognizable character, but she did have to be rescued by two males first. In contrast, Alis was strong from the game’s opening cut scene. Kodama had worked on games with female characters before (Quartet, for example), but never had a story that place one in such a prominent role. Ninja Princess didn’t give its heroine such broad powers and a team, and it used a pretty linear blueprint. Kodama wanted the main character, Alis, to be serious but also passionate. It was a difficult task to make the character appear as a strong warrior but also maintain a feminine look. Kodama went through almost a dozen different design patterns for Alis before achieving the desired look. Going with a woman as the protagonist for such a large-scale project was quite progressive in 1987, but Alis Landale wasn’t the only radical idea for a character the team had. They were even more open in their ideas for Alis’s companions, particularly the game’s Esper, or magic-using character Lutz. The early stages of Phantasy Star’s creation painted him as a much different character than the straight-forward hero he was in the final game, but Kodama experienced none of the design difficulties she had faced when creating Alis. Her first sketch of the character is almost exactly how he appears in the final game, a handsome and silent mentor-type. His gender, however, was initially ambiguous. “In the original story drafts of Phantasy Star,” Kodama revealed in a 1993 interview for the World of Phantasy Star book, “Lutz was a hermaphrodite, and as Alisa grew up, Lutz could become male or female. I thought that was interesting, so I depicted Lutz that way.” The ambiguity surrounding Lutz’s sexuality stemmed directly from early plans for Alis. The developers had thought of altering her to be more male or female, depending on the player’s in-game actions. That idea was dropped early on, and the team settled on making Lutz a male, but it was maintained that Alis wasn’t meant to be brought up as the typical damsel in distress that was such a common trope in games. Kodama put just as much thought into the other characters as she did Alis and Lutz, but interestingly enough, she didn’t design them. The party’s most physical character, Odin, was designed by Naoto Oshima, the same man who designed Sonic The Hedgehog. Kodama explained why in an interview for Sega of Japan’s Masterpiece Album developer series. “At the time I was like ‘I can’t draw a macho guy like this!’ so he ended up being designed by [Naoto] Ohshima, designer of the original Sonic. I really wasn’t into drawing these muscle guys back then.” The fourth character, Myau was done by a sub-designer known as “Choko. It’s unkown why, but it was likely due to scheduling issues. As large a game as it was, the final version of Phantasy Star was smaller than Aoki had first conceived. She had originally envisioned the Algol System having four planets, but memory constraints during development forced the team to reduce the count to only three. 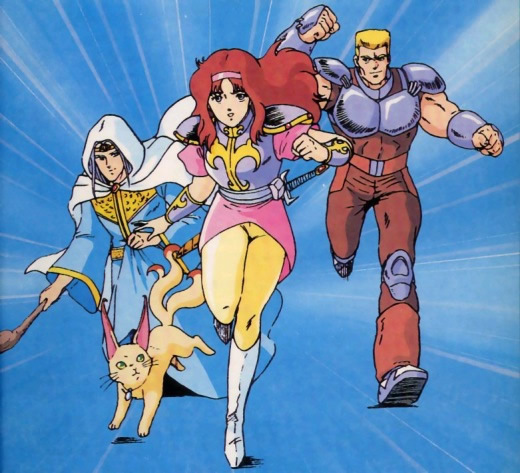 Considering that Phantasy Star clocked in at 4 megs, which was already huge for a Master System game, the fact that there wasn’t enough room to fit everything in Aoki’s plan shows just how massive her concept was. Sega gave the Phantasy Star team a great deal of creative freedom. All management wanted was a game that couldn’t be done on the rival Famicom console, and it exercised little control over the actual design process. This trust allowed the team to dream big, and one of the first things Lead Designer Kotaro Hayashida decided was that he wanted the dungeons to be in 3D. Hayashida had previously worked on Sega’s answer to Super Mario Bros., Alex Kidd in Miracle World, so he knew what it was like to take on a project that was supposed to contest Nintendo. He didn’t achieve the desired level of success with Alex Kidd, but the experience motivated him to give his concepts greater complexity. 3D dungeons were difficult on consoles, and it was a struggle to get them right on the Master System. The challenge attracted the attention of Yuji Naka and was his motivation for joining the development team. He had earned himself a reputation for making difficult programming tasks possible and completing them quickly. Naka was working on around three projects a year for Sega and had already ported Space Harrier and OutRun to the Master System. The chance to work on an RPG piqued his curiosity. He was a fan of Western RPGs on the Commodore 64 and Amiga, and he noticed that the dungeon screens in most of the PC games in the genre weren’t full-screen; they ran in in tiny boxes. He was inspired by this to tinker with his own 3D design, which wasn’t necessarily supposed to be an RPG itself. He only wanted to get a full-screen 3D perspective running smoothly. He figured that it could perhaps be used for an action game, since it was too fast for anything else. Naka developed a demo that had 3D corridors that could be navigated fluidly, perhaps too fluidly. “I was able to go down the corridors and do quick turns,” he told Retro Gamer magazine in 2017, “but then I experienced motion sickness. This was the first time I’d ever experienced motion sickness.” The effect wasn’t limited to Naka. It also made designer Miki Morimoto ill, a feeling she compared to “being drunk.” The dungeon also ate up the entire cartridge’s four megs, making it unusable for Phantasy Star. Naka fixed the motion sickness issue by slowing down the movement rate. By doing so, he also made it possible to include it in the RPG project. The slower dungeon freed up enough memory for the game content, something that didn’t surprise Naka. A turn-based RPG was much slower by nature than an action game, so it didn’t need the hardware to do as much. Having the dungeons move more slowly would fit in with the style and speed of Phantasy Star. The memorable planet and character designs of Phantasy Star were complimented perfectly by Tokuhiko Uwabo’s soundtrack. The game was also Uwabo’s first RPG work, and he coordinated closely with the designers to craft themes that would fit each particular scenario. The sound capabilities of the Master System made the process challenging. The team would request certain songs, which would often have to be rewritten if they didn’t match the gameplay. If they were too short, they weren’t as enjoyable. If they dragged on too long, they wouldn’t be completely heard in-game and would consume too much of the cartridge’s memory. Uwabo took these considerations in stride, having a good idea of what kinds of themes he would use. Melodies that came to him in the morning and survived the train ride to work usually found their way into his projects, and Phantasy Star was no different. He experimented with different sounds, and working in the same room with his colleagues made the process go much more smoothly. “Everyone could peek in on everyone else’s work,” he explained in 1993. “I could check out where the game designers were at, and the designers could look over and see how the sound was going.” Uwabo’s Phantasy Star score would become some of his most renowned work, and he considers it some of his best. The Japanese version of Phantasy Star was compatible with the FM sound unit, an expansion for the Mark III (Japanese Master System) that cost around $50 in 1987. The unit ran a Yamaha YM2413 FM synthesis chip to compliment the Master System’s SN76489 PSG (Programmable Sound Generator) chip and added nine extra mono channels. Around 60 games utilized it, but it was not included internally or as an expansion for the machine’s Western release, likely to keep costs down. Some argue that certain games sound better without it, but the increased depth of the instrumentation the FM unit added to Phantasy Star gave Uwabo’s score much heavier bass and a wider range. When it was released on December 20, 1987, Phantasy Star took the collective breath of gamers away with its lush and colorful worlds, catchy soundtrack, and brutally challenging dungeons. The game arrived only days after Square’s Final Fantasy debuted on the Famicom in Japan, giving the wallets of RPG lovers a two-hit combo that they gladly absorbed. American and European audiences received Phantasy Star the following year. Since the versions of the Master System released in those territories lacked the hardware for FM sound support, they were unable to partake of the exquisite sound that option brought to Uwabo’s soundtrack. U.S. gamers were, however, able to pay a whopping $70 or more for the game upon release, making it one of the most expensive game titles of the era. Numerous ports have been available over the years, on the Saturn, Game Boy Advance, and other consoles, as well as numerous download services like Nintendo’s Virtual Console. A remake for the PlayStation was developed in Japan under the Sega Ages line, with Kodama’s oversight, and plans were made to redo the entire quadrilogy as a single package. The Generations versions of the games featured enhanced graphics and music, as well as a more fleshed-out storyline. Characters spoke to one another and had more personality. Moreover, those who finished the first game would unlock a Nei-related bonus when they played Phantasy Star II. Unfortunately, only the first two games were remade, and they were never offered outside of Japan. Both were sold on the Japanese PlayStation Network in 2014, and English-patched fan translations were released on The Phantasy Star Cave website in 2012. While End of the Millennium remains Kodama’s favorite game in the series, the first Phantasy Star is the one to which she feels the closest. She recognizes its special place in history and the way it broke ground for console RPGs. Its 3D dungeons and female protagonist may not seem impressive now, but in 1987 they were milestones. These elements, combined with the sheer size of Phantasy Star, made it an experience like few others. There was no shortage of places to explore, monsters to fight, and new gadgetry to discover. More than the first in a franchise, Phantasy Star was the first truly epic Sega RPG. Decades later, the brightness of the Algol star has not faded from the gaming sky. Video Games Densetsu has shared some great Phantasy Star concept art, which can be viewed in the gallery below. Ali Almaci, Hasan & Kemps, Heidi. “Interview: Rieko Kodama.” The-Next Level. 13 Dec. 2004. Web. 09 Aug. 2017. “Phantasy Star Remakes Re-released on PlayStation Network in Japan.” Siliconera. 20 Aug. 2014. Web. 14 Aug. 2017. “Phantasy Star 1993 Developer’s Interview.” N.D. Web. 9 Aug. 2017. “Rieko Kodama on Phantasy Star [Videofenky interview translation].” SMS Power. 4 April 2003. “Sega 3D Classics Collection Developer Interview.” Sega Blog. 25 Apr. 2016. Web. 14 Sept. 2017. Thorpe, Nick. “The Making of Phantasy Star.” Retro Gamer. May 2017, pp. 52-57. That was a great article! I remember just waiting for this game. Reading the same Sega Challenge magazine over and over, or whatever other info I had on the game. I couldn’t wait for it to be released. The game didn’t disappoint either. To this day I play the tunes in my head or think about the game in some fashion. It was just awesome.